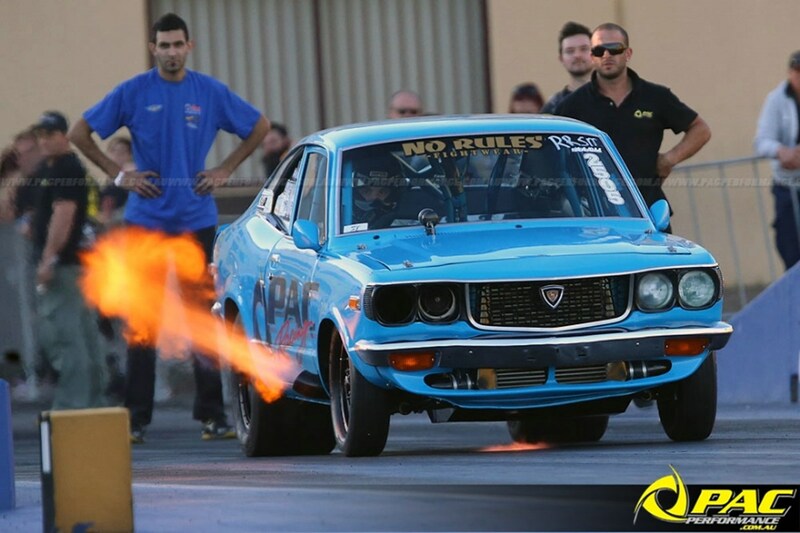 After a 12 month break from racing Jimmy Toskas came out firing in his RX3 coupe 'Homewrecker' on the weekend at Sydney Dragway. 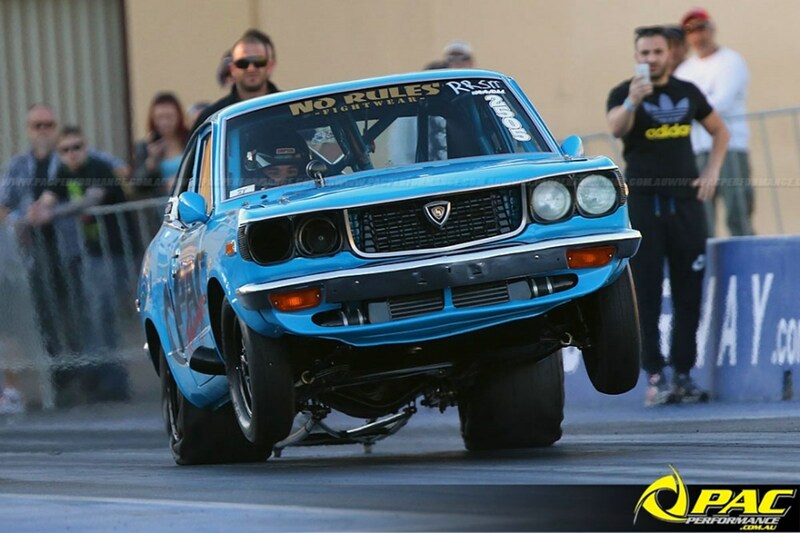 Competing in the Super Compact class against some big name competitors Jimmy wowed the crowd with wild wheels-up passes and 2-step flamage. Having previously run into the eight-forties Jimmy's coupe was already an impressive beast but what makes the car stand out from the norm is the fact it still runs a factory leaf spring rear end as apposed to a ladder bar or 4-link arrangement usually seen on race cars of this calibre. Straight off the trailer the car performed, putting down an easy 8.42 pass, followed by a 8.39@158, the new Garrett GTX turbo upgrade working wonders over the previous GT setup. 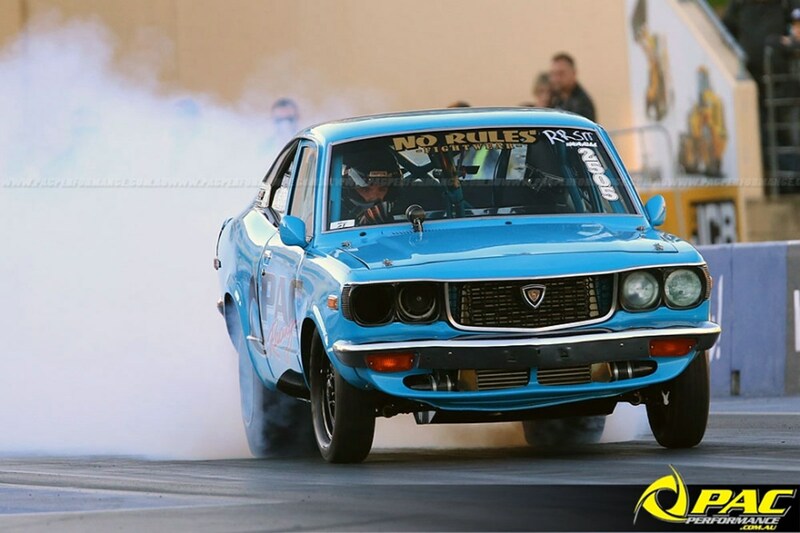 With Jimmy clearly getting right back into the swing of things behind the wheel, he once again chipped away at the cars ET, blasting out an impressive 8.14@165 PB on the next pass, the cars front left wheel held motionless in the air through the first 3 gears!! 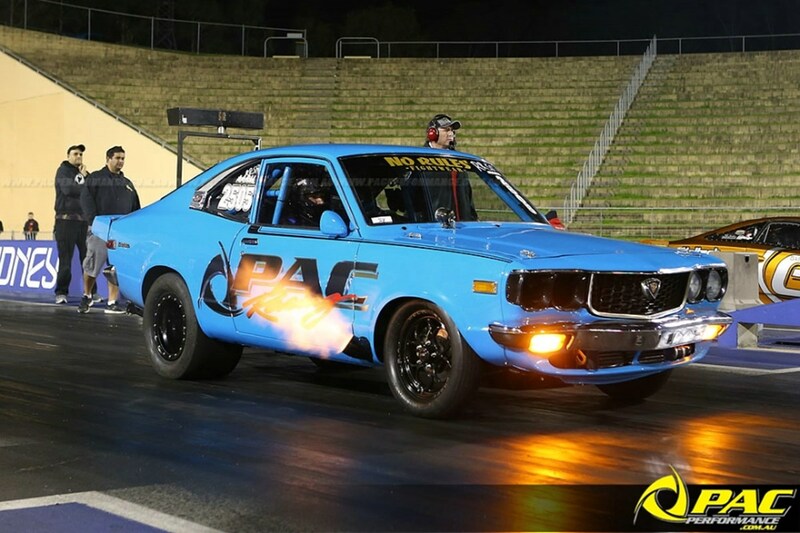 This pass sees Jimmy's 'Home Wrecker' RX3 secure it's places as the world's quickest leaf-sprung RX3, an awesome achievement for a rear-end that in tech terms is pretty archaic compared to setups some cars are running these days. It just goes to prove the saying 'If it's not broken, don't fix it'. On top of the world at this stage Jimmy moved into the finals in Super Compact, lined up against the big-gun 2JZ pro car of Joe Signorelli. Obviously Jimmy went into this pass as the underdog against the quicker Gas Motorsports Celica but that did not put him off one bit; Jimmy was going to give it his all to try and take home the win. We would like to congratulate Jimmy on his awesome re-debut of the car, the record and the meeting win. No doubt the car will only improve more from this point on so keep an eye out for this blue beast!